April 19, 2017 - What is toxicity? Most definitions would explain it as the degree to which a substance is poisonous. Knowing a substance’s toxic levels is particularly important to federal agencies that use the information to test potential risks posed to people’s health and to the environment. 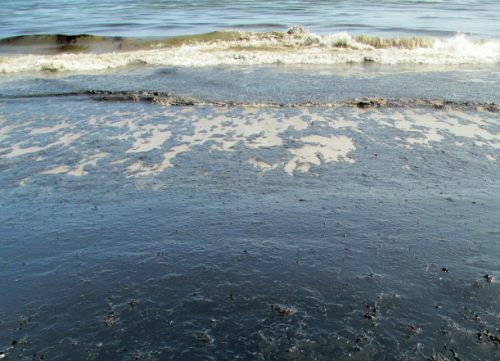 So how do scientists know how toxic something is and whether or not that substance—be it oil, chemical treating agents or toxic metals— will be toxic when introduced into marine or coastal waters? The basic tool for determining toxicity of substances to marine and aquatic organisms is the toxicity test. In its simplest form, toxicity testing is taking healthy organisms from a container of clean water and placing into one containing the same water with a known concentration of a pollutant. The observer then watches to see if, and when, it appears to become lethargic, sick or dies, and comparing those results to the organisms left in the clean water. The testing process for determining toxicity in marine environments is detailed, rigorous, and time consuming. There must be containers of both the uncontaminated (clean) water (called a control) and the pollutant-treated water; a bare minimum is five containers of each. The reason for the replications is the concept of variability. Given five test organisms, such as a fish species, there will be a range of sensitivity among them. Having multiple testing samples allows scientists to determine the level toxic to the average organism and the level toxic to the most sensitive organism. Having more than one of the same organism in each test container is required; ten is standard. It’s easy to see how a toxicity test grows in complexity: 50 specimens for the controls (10 in each of five replicate containers) and 50 more in the five treated containers (10 in each of five replicate treatment containers). That’s 100 organisms. But then, to find out what concentrations of the toxicant are safe and which are not, there needs to be at least five different treatment concentrations, each with five containers and each container with 10 test organisms. Now we’re dealing with 600 test organisms and 60 test containers. Then apply a statistical procedure to estimate the median concentration of the toxin that maimed or killed half the organisms and write up the results. The key is to write it up with enough information so that someone else can exactly duplicate the test. Added to all this, the design of a toxicity test must include a number of features to insure there is no bias in the results. The containers must be lined up randomly and given codes so that the researcher doesn’t know until the experiment is over which containers had which concentrations. Water quality must be monitored to ensure that temperatures and oxygen remain the same in all containers. Once the data is collected, the researcher must calculate the median lethal concentration, meaning the concentration of toxin that would kill half the test population. Further, it is important not to rely only on one experiment. The whole thing should be repeated once or twice more to be convinced that the first effort was not a fluke. Finally, the researcher must write a report that not only describes the experiment and results, but also puts them in context with similar data from other studies reported in the scientific literature. These are the steps scientists go through to determine if a substance is toxic and at what concentration levels. In reality, today, toxicity testing is even more complicated and detailed. There are now many measures of toxicity other than death or sickness: for example, many tests done today look at “endpoints” such as effects on enzyme systems, or changes in animal behavior or decreases in egg production. The final use of toxicity data is comparison with concentrations measured or expected in the field. If the concentrations of a pollutant in the field are below any of the concentrations deemed “toxic” in the laboratory, it may well be that the pollutant is not a problem. If concentrations in the field are higher, then there is cause for concern. By Alan Mearns, Ph.D. Mearns is an ecologist and senior staff scientist with the Emergency Response Division.